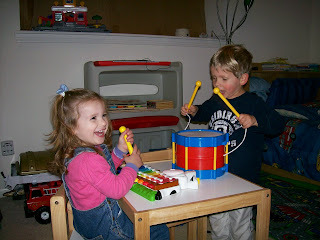 Kaelin and Dawson looking so adorable together. They've become such good friends and it is always a joy to see them together. 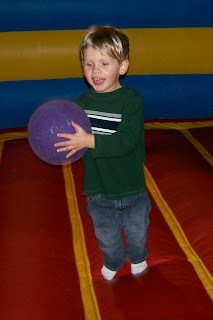 I took Dawson to a local gym class to see if it would be something he would enjoy and benefit from. Unfortunately, it wasn't what we had hoped. 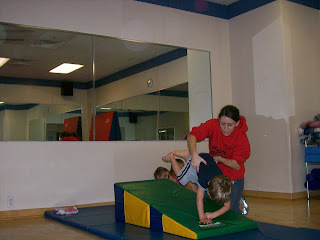 It's more of a learn gymnastic techniques class than a fun play class. 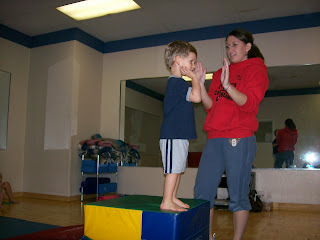 Most of the time he was sitting against the wall waiting his turn (or not sitting quietly by the wall and getting reprimanded by the instructor). 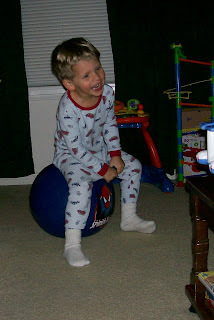 Every 10 minutes he would have a turn to to a flip or jump or something, which didn't result in a lot exercise or play. It was very much a disappointment. 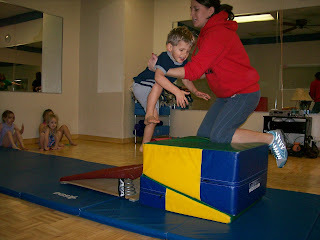 But I did still manage to take a few pictures of the rare moments when Dawson had the opportunity to do some gymnastics. Jumping up onto the mat. Giving the teacher a high five. 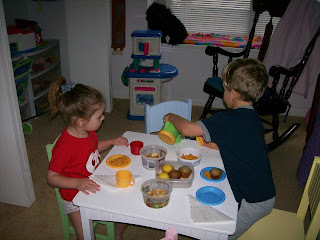 Dawson's friend, Kaelin, invited him over for a tea party and some play time. 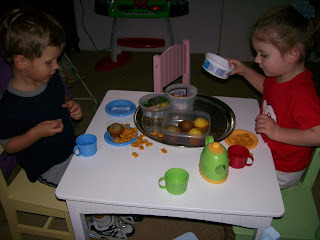 They were so cute sitting at the little table enjoying tea (really water), snacks, and each other. They were especially amused with a continued game of "cheers." I never new saying "cheers" and clinking cups together could be so entertaining. 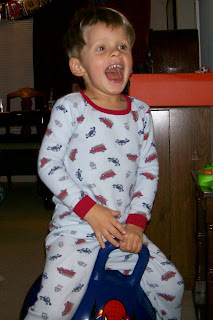 The joy of childhood! Kaelin pouring tea and Dawson getting the cups just right. 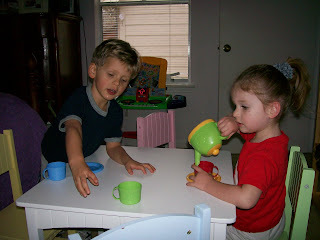 Dawson pouring some tea for me - what a sweet boy. Whenever he sees Christmas decorations that have yet to be put away, he'll point them out, then grin and say, "Silly people. Christmas is over." Any time we go to Conroe or The Woodlands we pass by the gigantic Sam Houston statue. Dawson will wave to him and say, "Bye, Sam Houston." And when we return to Huntsville and pass by the statue again, he'll say, "Hi, Sam Houston, we're back." 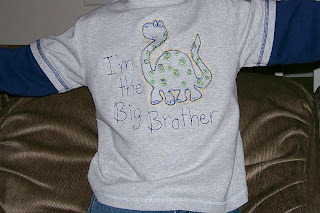 When we see a baby anywhere, he'll say, "Awe, what a cute little baby." Then he'll want to go over and stroke the baby's cheek. If he thinks it should be quiet, he'll put his finger to his lips and say "shhh." He does this to us if we're talking and he's trying to watch one of his shows on television. And if the birds are being especially noisy he'll tell them to "shhh" too. If we offer him some new food that he doesn't want to try, he'll tell us, "No, it's yucky." Whenever he gets hurt, he's taken to saying "ouchie." 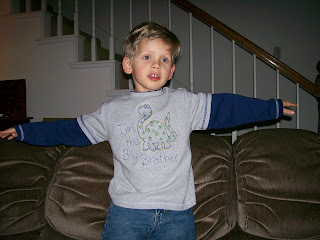 When he's not feeling well (like when he has a cough) he'll look at us and say, "Can you make me feel better, Mom/Dad?" And what makes him feel better is us putting our arm around him and resting our hand on his stomach. If our hand isn't in just the right spot, he's sure to put it where he wants it. It was so great to have all our friends at Incredible Pizza Company. 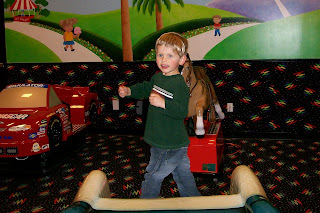 Dawson had a terrific time playing with all of them. 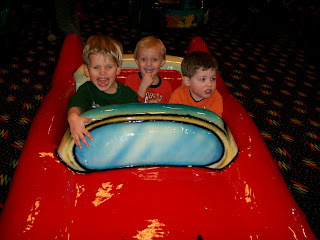 The boys (Dawson, Hutton, and Eli) cruisin' in the car. What a great smile and what a cute boy! 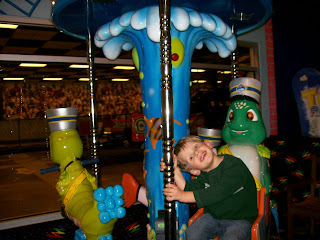 Round and round on the carousel. Trying to decide what to do next. Playing whack-a-mole as Rosalie looks on. 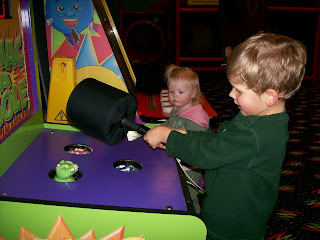 Playing one of the newest game at Incredible Pizza - he had to pound the button, which shot balls up into the clown's mouth. 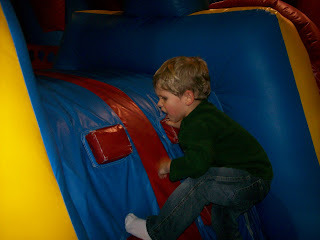 Here are a few pictures from our time at Pump It Up. 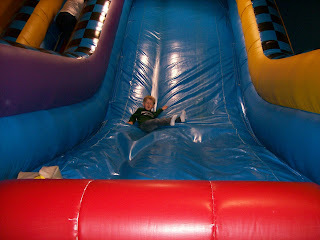 Dawson going down the giant slide. 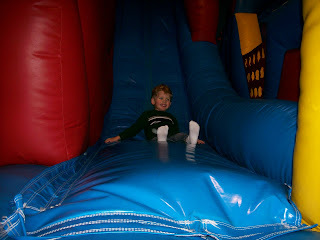 He loves this slide - he did it over and over again. 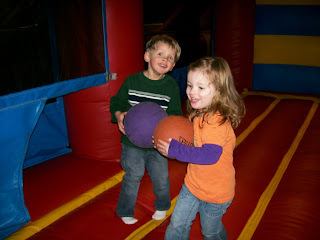 Jumping around in the basektball court. 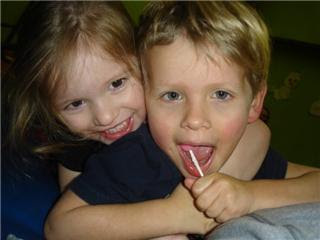 Dawson and Kaelin - what a cute pair! Working really hard to get over the wall. 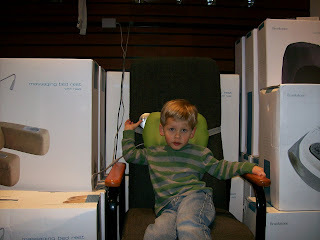 Enjoying a massage at Brookstone. Dawson requested pink cupcakes (a.k.a. strawberry cupcakes) for his birthday. 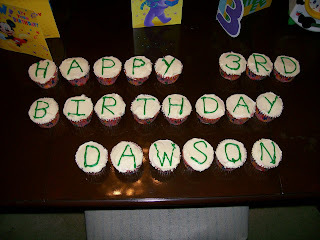 He liked the birthday message spelled on them and continues to enjoy picking which letter he wants to eat. 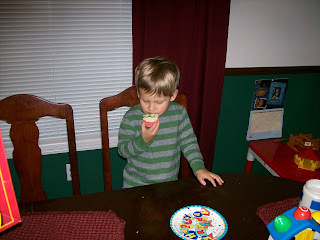 He chose "B" as his first cupcake. Then he specified which cupcakes he wanted Randy and I to eat. The great thing about a January birthday is that all the toys leftover from Christmas are on clearance. 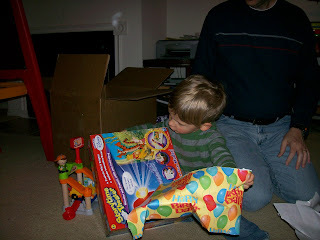 We got so many good deals, which made for lots of birthday presents. 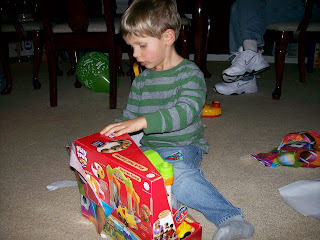 Here are some pictures of Dawson opening a few of his presents. 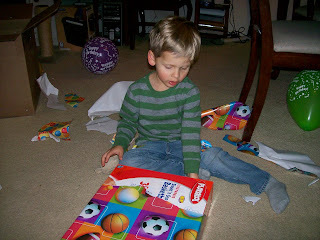 He was very excited to see all the presents and thrilled to rip the paper off of each one. 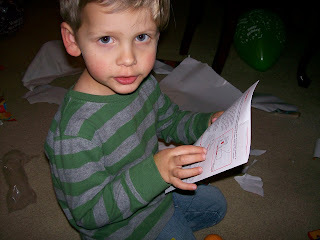 He actually took the instructions from me and told me "I'll read instructions." Then he pointed at each step and said, "do this, do this, do this." 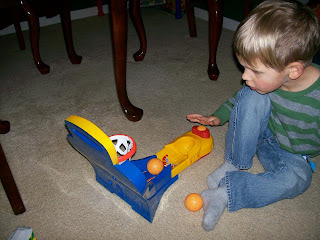 Playing his basketball game. 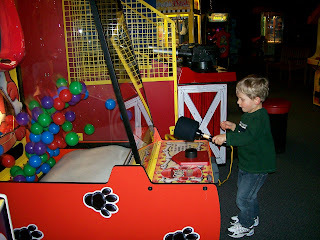 Of course, he has more fun hitting the button really hard and making the basketballs fly way over the goal and scatter throughout the room. 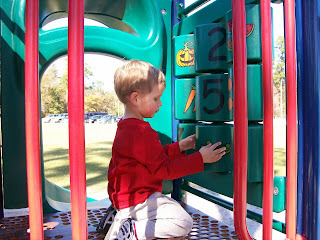 Opening one of his wooden play sets. It's mostly plastic with some wood accents, but it's marketed as a play set with real wooden pieces. 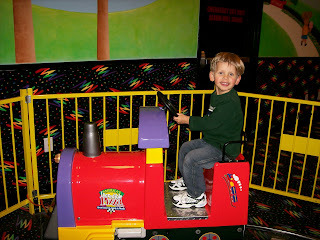 Dawson loves it anyway - it has buildings and cars and people perfect for his imaginative play. This is a story time projector that projects stories onto the wall. He was happy to see Winnie the Pooh and Tigger on the box. 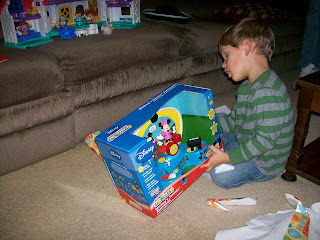 A Mickey band set. He is so cute dancing around to the music that they play. 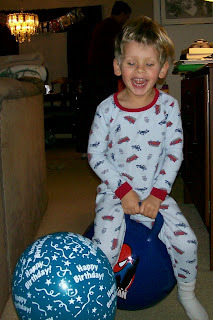 One of Dawson's favorite birthday toys is a big spiderman ball with a handle that he can hold onto and bounce all over the house. He's had so much fun with this! 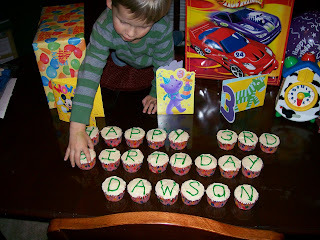 Dawson is 3 years old today!! 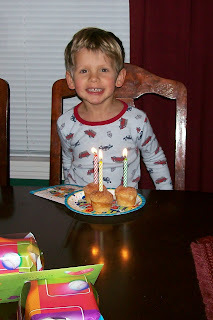 Happy Birthday to our big 3 year old!! Every morning after breakfast, Dawson and I head to his room to play animals. 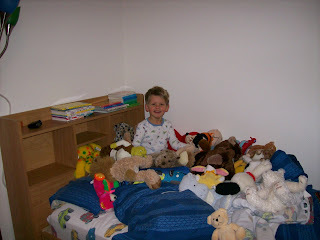 He's accumulated a number of stuffed animals through the years and he likes to play with each and every one. We'll dump them all onto the bed and he'll bury himself in them or they'll have elaborate conversations with each other. He frequently tells me which animal to make talk and will even tell me specifically what he wants the animal to say. He has so much fun with his animals and never seems to tire of playing with them. 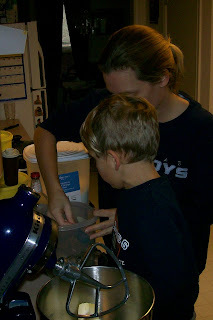 Dawson is becoming such a big helper in the kitchen. 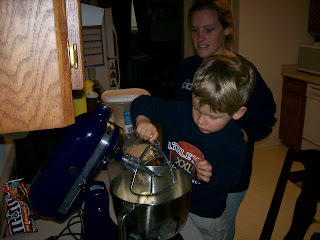 We spent some time this week baking cookies and he was wonderful at pouring the ingredients into the mixer, dropping the cookie dough balls onto the cookie sheet, and then putting them on the rack to cool. Of course, his favorite part was eating them!! 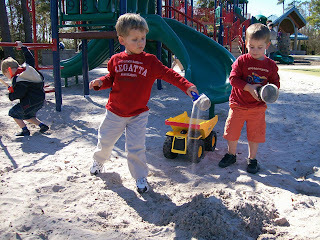 Another great feature of Northshore Park is the giant sand pit. 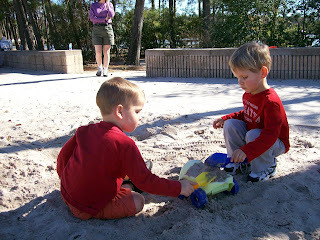 Dawson made a friend and the two of them played all over the sand pit. Piling dirt into a truck and packing it down. Creating a big mountain, which of course they enjoyed demolishing once it was finished. 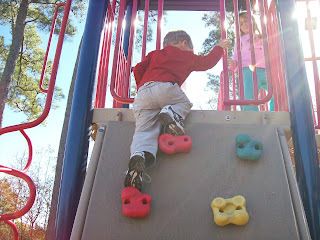 Here are some more pictures from our time at Northshore Park. 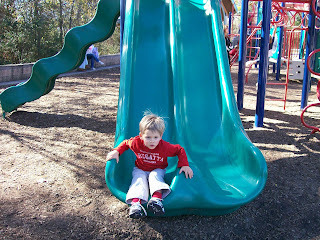 He just zipped down the slide. He loves jumping off anything tall. 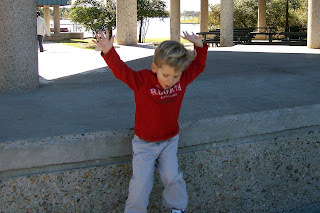 Here, he's jumping off the pavilion at the park. Lining up all the food pictures. 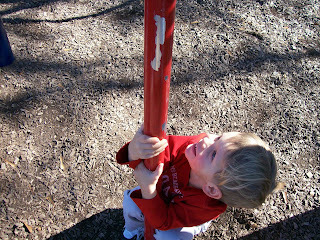 We visited Northshore Park this weekend - one of our favorite parks. 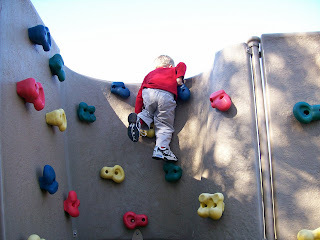 On previous visits, Dawson has been fascinated with the rock wall but unable to climb it unassisted. 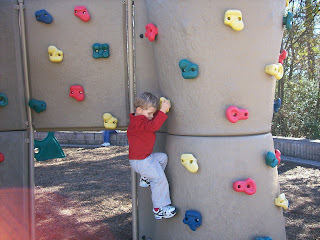 It was a different story this time, as he made it all the way to the top by himself (several times). 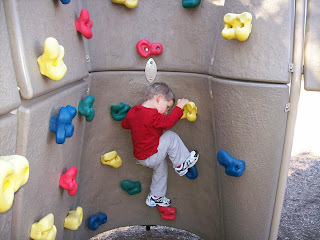 He's officially mastered the rock wall. Dawson likes to pretend to go to school. 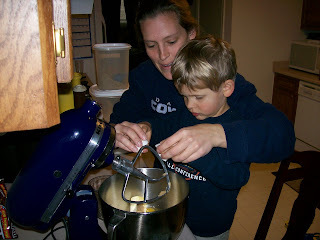 His school happens to be located in the play area in our kitchen. And apparently, coloring is very popular at school as that's what he always does when he's at school. 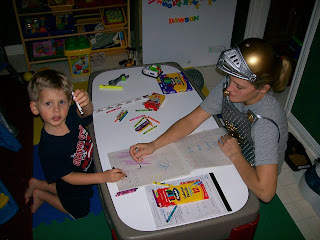 On this particular day, he wanted the knight to go to school with him. He had me wear the knight costume and constantly referred to me as knight. "Knight, use this color." "Color on this page, knight." "Let's go learn at school, knight." He's so funny! !